Case Management Consulting Solutions - Professional Medical Case Management Companies, Medical/Vocational Rehab, Michigan, Nursing Case Mgt. 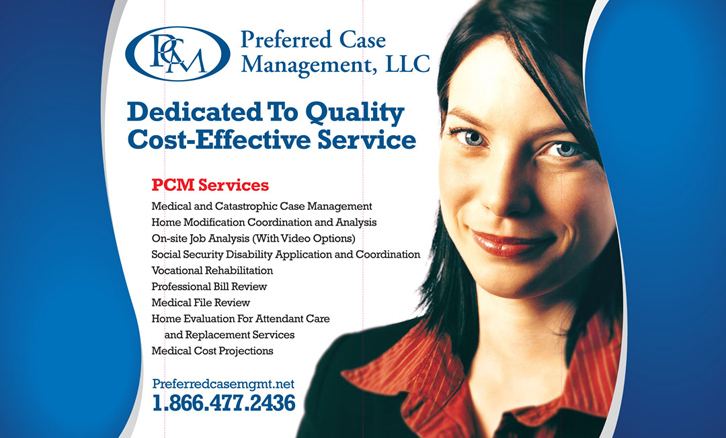 We conduct ourselves with respect, dignity, and knowledge in order to represent Preferred Case Management in the most professional manner while delivering appropriate case management solutions to our clients. We are committed to PCM’s values of quality cost effective service and customer satisfaction. We are committed to the rehabilitation process and to assist our clients to achieve maximum medical improvement. We believe that being positive, well informed and having a continued desire to learn are attributes that promote teamwork, company reputation, company growth and new referrals. We move quickly and wisely into action to promote customer and client satisfaction. We strive for well-rounded employees who are able to manage their files appropriately with regular customer contact, client contact, regular appointment attendance and timely reports to promote satisfied customers and clients. As a company, we push ourselves to become proficient, well-informed and professional medical and vocational consultants.